According to a new report from the Wall Street Journal, President Kushner failed to reveal business ties with George Soros and Goldman Sachs, as well as loans totaling "at least 1$ billion." Jared Kushner, the president's son-in-law and senior adviser, didn't identify on his government financial disclosure form that he is currently a part-owner of a real-estate finance startup and has a number of loans from banks on properties he co-owns, according to securities filings. Mr. Kushner's stake in Cadre--a tech startup that pairs investors with big real-estate projects--means the senior White House official is currently a business partner of Goldman Sachs Group Inc. and billionaires including George Soros and Peter Thiel, according to people close to the company. The Cadre stake is one of many interests--and ties to large financial institutions--that Mr. Kushner didn't identify on his disclosure form, according to a Wall Street Journal review of securities and other filings. Others include loans totaling at least $1 billion, from more than 20 lenders, to properties and companies part-owned by Mr. Kushner, the Journal found. He has also provided personal guarantees on more than $300 million of the debt, according to the analysis. 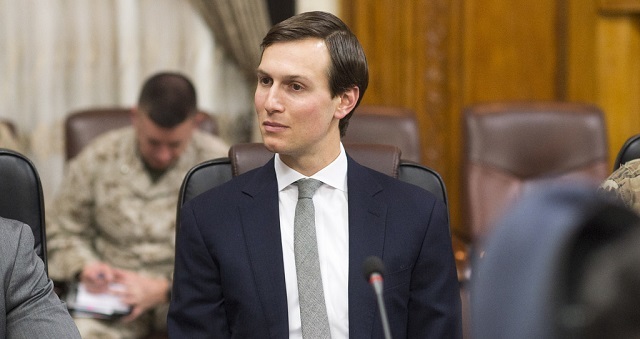 Jamie Gorelick, a lawyer representing Mr. Kushner, said in a statement that his stake in Cadre is housed in a company he owns called BFPS Ventures LLC. His ownership of BFPS is reported in his financial-disclosure form, although it doesn't mention Cadre. ...Mr. Kushner co-founded Cadre in 2014 with his brother Joshua and Ryan Williams, a 29-year-old friend and former employee of Kushner Cos., the family-controlled business that Mr. Kushner ran until recently. Cadre markets properties to prospective investors, who can put their money into specific buildings or into an investment fund run by Cadre, which collects fees on each deal. To get off the ground, Cadre turned to a Goldman Sachs fund and a number of high-profile investors. Among them were the venture-capital firms of Mr. Thiel, Silicon Valley's most prominent supporter of Mr. Trump, and Vinod Khosla, a co-founder of Sun Microsystems Inc., according to Cadre's website. Other backers include Chinese entrepreneur David Yu, co-founder with Alibaba Group Holding Ltd.'s Jack Ma of a Shanghai-based private-equity firm, hedge-fund manager Daniel Och and real-estate magnate Barry Sternlicht, people close to Cadre said. Cadre also secured a $250 million line of credit from the family office of Mr. Soros, a top Democratic donor who Mr. Trump criticized during his presidential campaign, the people close to the company said. Mr. Soros's family office is also an investor in Cadre. The investors declined or didn't respond to requests for public comment on their backing of Cadre, but a person familiar with Mr. Soros's family office said it had invested in early 2015, before Mr. Trump declared his presidential candidacy. Two years ago Kushner was getting a quarter of a billion dollars from George Soros, now he's running the country with Goldman Sachs Democrat, "Globalist Gary" Cohn.